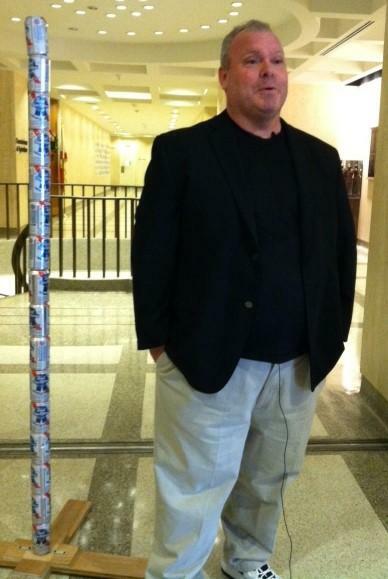 Chaz Stevens and his Festivus beer can pole meet with reporters in the Capitol. A 6-foot pole made of Pabst Blue Ribbon beer cans is making news around the world as it stands in Florida’s Capitol building. Maker Chaz Stevens and his beer-can pole have been featured on the Colbert Report, the Huffington Post, and the major networks. "They were talking about me in Australia," Stevens told reporters in Tallahassee. The South Florida blogger drove seven hours from his home in Deerfield Beach to display the pole celebrating Festivus, a parody holiday that gained notoriety in the sitcom "Seinfeld." The show's characters decided that Dec. 23 should be a day “for the rest of us” who don’t want to take part in the commercialism of Christmas. Stevens, an atheist, made the trip after hearing about a nativity scene inside the Capitol. The pole will be on display until January 3. After hearing about the nativity, an array of groups sent requests to the Florida Department of Management Services to display their holiday messages, like the Tallahassee Atheists and the Satanic Temple of Tallahassee. Pam Olsen with the Florida Prayer Network said she’s praying for Stevens as well as the group that posted a banner celebrating freedom from religion. The competing displays led to a brief spat, with Stevens telling Olsen to remove the nativity. "Well, it won't be removed, because we have freedom in America. Remember that, sir,” Olsen said. “We also have the separation of church and state government," Stevens replied. Stevens said he expected a push back from Christians. Next stop for Stevens? He’s pondering a Festivus beer-can pole in the nation’s capital. Time was, the stretch following Christmas Day until New Year's Day was a quiet, sleepy spot on the American calendar. The six-day span hung like a lazy hammock between the holidays. Nowadays, the WAC — Week After Christmas — is busy and abuzzing. All around the country, Americans continue to celebrate — Kwanzaa, the Christmas afterglow and the coming New Year. South Florida shoppers wiped the turkey gravy off their lips and got in line to shop last night as Black Friday morphed backward into Thursday to kick off an ever-earlier Christmas shopping season. 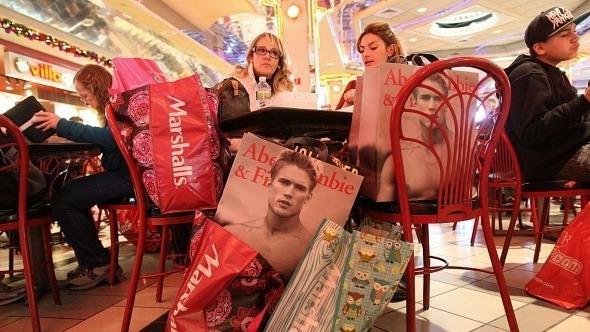 Lines for the early deals began forming before sundown on Thanksgiving and the scenes at the big boxes and malls grew more hectic and even chaotic overnight.